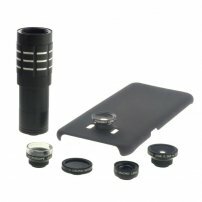 6-in-1 2.8X Macro, 20X Microscope, Wide Angle, Fisheye, CPL, 12X Tele Lens Set for Galaxy S8 S8+ : allputer.com - Accessories for all your Portable Electronics & Computers! This set contains all the important elements in photography, with this kit set, your smartphone is a quasi-DSLR, you can have the microworld in our screen (Macro Lens and Microscope lenses), you can included many more friends in the same pictures(Wide Angle Lens), you can create a wide panoramic or hemispherical image (Fisheye Lens), you can polarize the light effect to make your pictures more stunning(CPL Lens) or even zoom the distant object in to fill your screen(Telephoto Lens). The use is so simple. Simply screw the lens in to the customized phone cover and you're ready to go, all the lenses are interchangeable, just need to consider what effect you are going to create, then you can do it instantly. - BIG SAVINGs: One purchase for long use, the lenses are still usable when you change to a new phone, say Galaxy Note 9, iPhone 9 Plus or even others - HTC, Sony or so), so when you got a new phone, just check with us if we have such cover, then you just need a new cover instead of buying a new set. - All the lenses are interchangeable, so once a photo cover is on, you can use all the lenses included. - Extra Back cover is available, either replacement or for other future new phone models (see note below). - OPTIONAL With Mini tripod for taking pictures under extreme situation. - Lenses are detachable from the cover, when you don't need the lens, just screw it off then you can go. - Good quality and competitive prices! - There are a macro lens comes with the Fisheye Lens, Wide Angle Lens, it is not the included HD 2.8X Macro Lens in the kit. - For model with Dual Lenses, please note only one of the cameras - the outer one will use with the add-on lens, the other camera may be blocked or not compatible with the add-on lens. - The phone cover may be packed independently outside of the pack for Lenses and Accessories, but no worries, it will be in 1 shipment.